I call Kapalua the Country Club section of Maui. The Ritz Carlton is there and golf is everywhere. It's worth the drive for dinner, though. There is a lot of great sushi on the island but Sansei is our favorite. They have some great signature dishes but the must haves are the calamari salad. 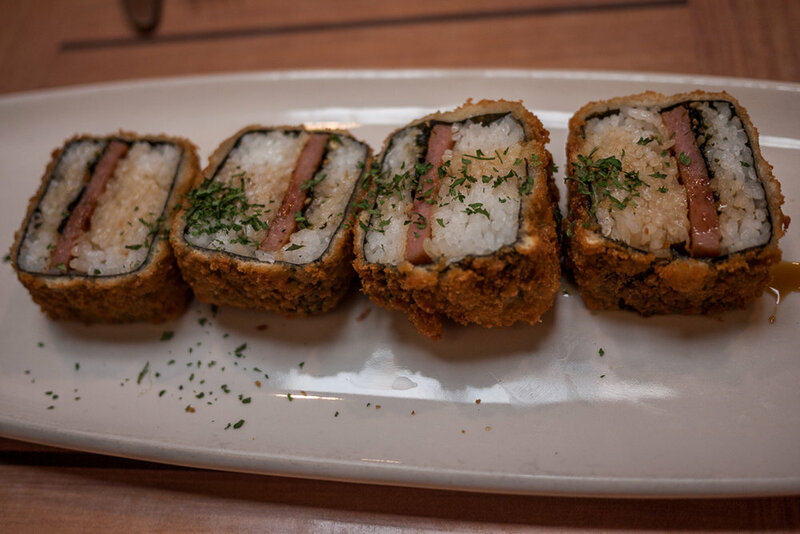 And the Panko Crusted Ahi Sashimi Sushi Roll which is probably the most popular. We like to wash everything down with our favorite sake. This is another place we go to year after year. We paid a visit to another Kapalua restaurant, Pineapple Grill, at the insistence of a couple of friends. The spring rolls were yummy. The Ahi Steak looked impressive but was just okay. As was the Mahi Mahi. The standout, though, was the pineapple upside down cake! I recommend just going straight for dessert. We can't leave the island without having a plate of local fare consisting of Spam, sticky rice, and macaroni salad. I know, Spam! When in Rome, people! One of our favorites is Da Kitchen. It's in a strip mall close to the airport so it's perfect for filling up before flying home. You'll find mostly locals and a smattering of tourists populating the tables. The feature is the Spam Musubi. After that, you can tackle the Loco Moco or Teriyaki Chicken, but this trip we went for the Teriyaki Burger. FYI, Da Kitchen does not serve alcohol. Check out all my Maui pins on my handy map!